The old one-two punch and defense against it. I wasn't sore after this workout, but my left arm was a little tired from throwing so many jabs. 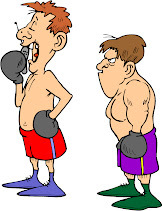 My coach, Bernard, always talks about drilling the basics: throwing the left jab for an hour. It's an important punch; since it provides the foundation for my offense as a right-handed boxer, it is worth practicing it over and over. We may spar next time to put everything together. I also did 40 minutes of roadwork today. It was a sunny, mild day--a great day to be outside.